I once saw a mural of Jesus in the classic “sitting-on-a-rock-looking-over-Jerusalem-at-night” pose. The first thing I noticed was the way the painter had depicted the face of Christ: he was not attractive at all. 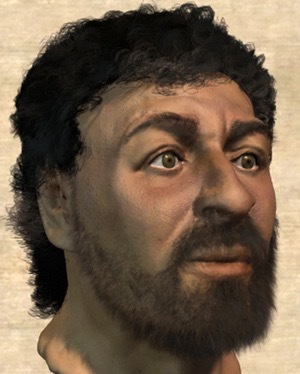 In fact, the face was quite unremarkable in every way and quite unlike the “expected” image of Jesus. Had someone taken the context of the painting away, shown me only the face and asked me to guess who it might be, Jesus would have been low on my list. In all honesty, there was a part of me that felt slightly offended by the way he looked. There were no chiseled features. No piercing, yet warm, eyes. My view of Jesus can be too glamorous. Certainly he is the King of the universe. Yes, he is the unique God-man. And all creation hinges upon him. For he grew up before him like a young plant, and like a root out of dry ground;he had no form or majesty that we should look at him, and no beauty that we should desire him. He was despised and rejected by men, a man of sorrows and acquainted with grief; and as one from whom men hide their faces he was despised, and we esteemed him not (53:2-3). In his appearance, he was unremarkable. There was nothing attractive about him. Why does that unsettle us? Maybe it is because we have seen so many depictions of Jesus as a beautiful human, and a plain-looking Savior clashes with the artistic precedent in our minds. The expectation of a carefully-tended Messiah was popularized largely by the mass spread of religious artwork in the mid-1900’s and standardized by Warner Sallman’s work, “Head of Christ.” The painting even looks like a celebrity headshot from the 1940’s. But a not-so-handsome Jesus? That idea pushes back against our collective, media-influenced preconception. Maybe we forget that a God who came as a baby, was born in humble surroundings and labored as a common workman is the same God who would move among the masses for years, unknown and without fanfare, until beginning his redemptive work. And even then, his own family members did not see him as being a candidate for Messiah (Mark 3:21, John 7:5). Do I want my Jesus to be a regal human? Yes, I want the human Jesus to be attractive to and accepted by society because he calls me to live as he did, and I don’t want to follow in the footsteps of rejection. One does not aspire to rise to the example of Jesus, but must die to self and stoop to his example. Would I have followed Jesus back then? Would I have dismissed him? Would I have been put off by his appearance instead of receiving the beauty of his message? Do I avoid following Jesus as closely as I should because I know rejection follows that kind of faithfulness?